It’s Sunday – time for coffee, long, lingering brunches and catching up on the internets! 1. Pie or Cake, that oh so vexing question. For me, it’s cake. ALWAYS cake. 2. But, speaking of pie, it is delicious, especially in caramel apple biscuit form. 3. This is an awesome sneak peek into my dream professional test kitchen. 4. Eater has been killing it with its long form lately. Last week it was spam, this week it’s all about ramen – specifically Sun Noodle. 5. Speaking of ramen, I wish I could visit this ramen room (via Foodbeast). 6. Do you speak emoji? 7. I want to host a summer crostini party and serve nectarine and fig summer salad. 8. I wish I had some red bean ice cream in my freezer. 9. Autocorrect – love it or hate it? 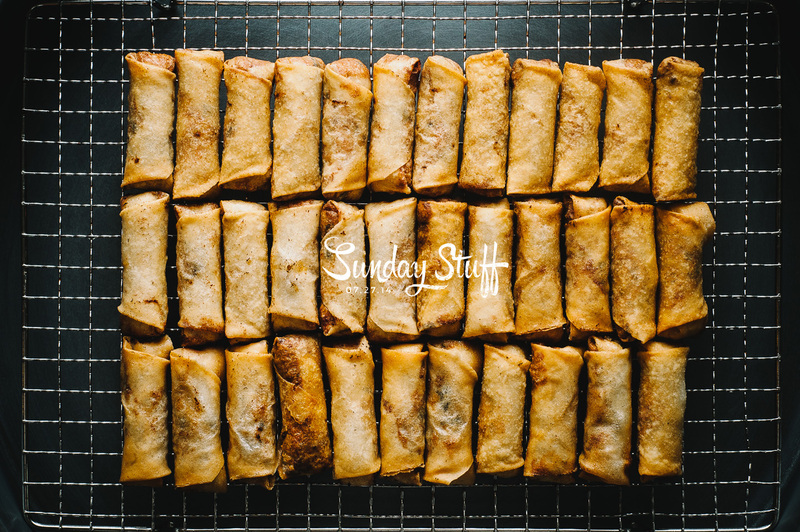 PS – The lead photo is of one of my favourite things to make and eat: Vietnamese spring rolls. Mike and I gorged ourselves on Friday night while watching a movie. It was good times. Cute new post. :) Like you, I too prefer cake over pie, but pie as a caramel apple biscuit…well, hold the phone; we may have a winner. Emoji! Absolutely fluent in emoji, who isn’t? A testament to your fluency is definitely that emoji game that makes you guess phrases like “time out” or “party animal” with the given emoji & maybe another hint or two. Gooodness that crostini summer party looks fantastic. Gotta try that out one day. Sure to be a crowd pleaser. I’m sure you’d put a nice asian spin on it too! Maybe like the stuffings of an eggroll on a crostini. Can’t go wrong with that! As for the red bean ice cream, you’re very much capable of making it in your own home with some coconut milk! :D Then you’ll always have it in your freezer given that you don’t eat it all! Dude, I loved that Sun Noodle article! So, so interesting (especially all the Hawaii tidbits). 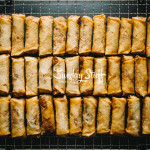 Also, I’m DYING over these spring rolls! That shot is mesmerizing. And sending you oodles of hugs for the link love, Steph!